As the snakes were approaching their first victim - the cat in cargo - the crowd was chanting: SNAKES, SNAKES, SNAKES ... great audience effects, they were hissing during the slow dialogue parts ... best one-liners were spoken by the pilot: "This plane is going down faster than a Thai whore." 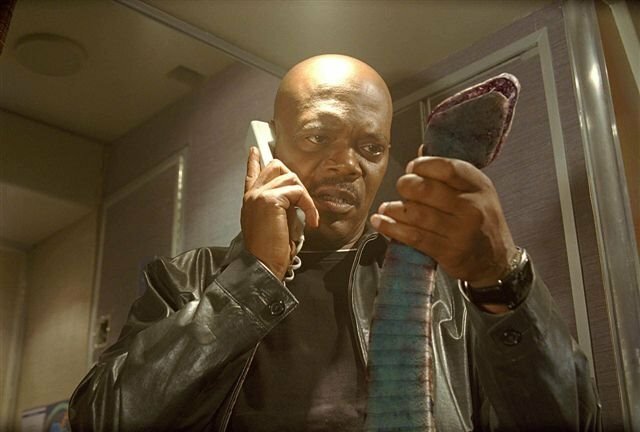 Of course Sam Jackson had the memorable: "Great, Snakes on Crack." oh GOD, there's a little internet review of SOAP up, should I share? Would it be unseemly for me to plug my review of "Snakes on a Plane" on my blog? It would? OK, I won't. Glad to hear that, at least for you, this one lived to the amazing hype .. I wanna see this motherf*cking movie right now! (but I'll have to wait until tomorrow, darn it!